Isaac Asimov's Robot City, Robots and Aliens, Chageling by Stephen Leigh. Book in good condition and all pages intact. 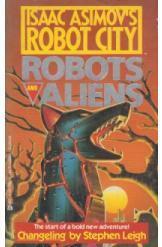 This book is from Isaac Asimov's Robot City series for contemporary new sicence fiction talents. Derec must answer the call of a besieged city on an alien planet. He must protect a fantastic metropolis of robots from wolf like beings who stalk and threaten its destruction.